Our friend Chris hosts his birthday weekend every year in the Hamptons. This year, he asked us to provide some TWINSPIRATION for the big 35. We proposed a “Golf Pros and Tennis Hoes” themed PAR-TEE for our preppy friend. We loved taking a traditional college theme and putting our country club spin on it. Our weekend festivities began with pizza, prosecco, Aperol cocktails and “Brosé” on Friday evening. We were greeted with an adorable welcome sign from Chris’ mother. On Saturday we spent the afternoon relaxing at Cupsogue Beach. The weather was beautiful and we enjoyed soaking up some sun and walking along the beach. Saturday night was the main event- the GOLF and TENNIS themed birthday par-tee that was full of witty treats, details and decorations. We selected a color palette of navy, kelly green and white. We incorporated the traditional argyle pattern to add a touch of preppiness. We infused tennis and golf details throughout the décor. Olga from International Garden created our adorable floral arrangements with white football mums and green ball flowers. For some added whimsy, we placed golf balls inside the vases and topped each arrangement with a “35th” golf flag. We also added tennis balls to the table decor. We recommend creating a seating plan for formal dinner parties of eight or more. Placecards not only assign seating but also serve as beautiful table decorations. 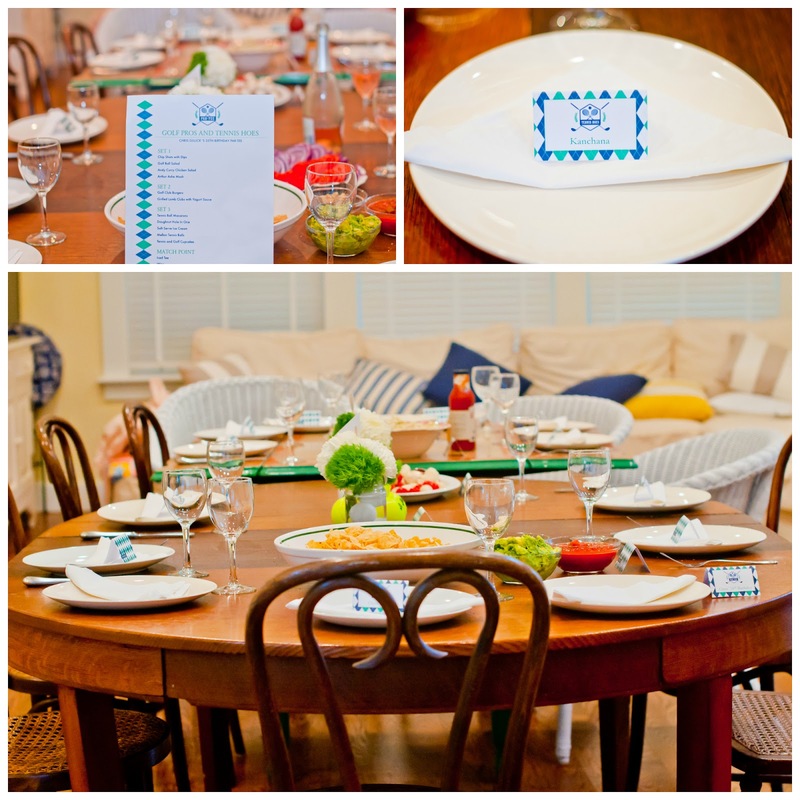 We purchased adorable argyle navy blue and kelly green food tents by ThenComesPaper and used them to create our placecards. ThenComesPaper created a logo that combined tennis and golf elements that fit our theme perfectly. Guests were asked to wear preppy attire that would belong in a Ralph Lauren catalogue. The birthday boy looked AMAZING from head to toe. Guests sported Polo, Vineyard Vines and Lacoste shirts, shorts and dresses. Guests loved channelling their inner preppiness. Kanchana composed an exquisite menu featuring golf and tennis inspired apps, mains and desserts. We wanted to minimize cooking / grilling time for Saturday night so FreshDirect supplied the appetizers and mains (They deliver to the Hamptons in the summer). We even purchased our wine from FreshDirect (They have a partnership with Union Square Wines). We ordered some delicious Pinot Noir and sparkling white and rosé. Baked by Archana created the delicious golf and tennis cupcakes. We picked up tennis ball macarons from Macaron Parlour and “doughnut hole in ones” from Donut Pub. We also served sal-tee caramel soft serve ice cream. The beverages continued the tennis and golf theme with our Fireball Drop Shots and Honest Peach Tee. Guests also sipped on copious amounts of white wine and rose. Our friend, Camille, supplied her refreshing All Beauty Water, which has lots of vitamins and nutrients. Happy 35th Birthday Chris! We had an amazing time at your par-tee and hope you did too. Previous Post Red, White and Wedding! Next Post Summer Camp is Not Just for Kids!